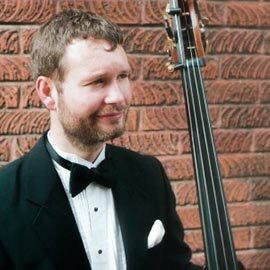 A native of Edmonton, I was introduced to the bass at age 17 by Ioan Tetel of the Edmonton Symphony and spent 2 years studying jazz at Grant MacEwan College with the ESO’s John Taylor. I went on to receive my Bachelor of Music degree at McGill University where I studied with Orchestre Symphonique de Montréal bassists Brian Robinson and Eric Chappell. My Master of Music is from Yale University School of Music, where I was under the tutelage of Donald Palma, Founding Member of the Orpheus Chamber Orchestra. During my time at Yale, I made my debut at Carnegie Hall in New York and Symphony Hall in Boston. After a year of guidance from Boston Symphony Orchestra bassist James Orleans, I joined the Kitchener-Waterloo Symphony Orchestra in 2008. During my time in the region, I have appeared as soloist with the Kitchener-Waterloo Symphony and Kitchener-Waterloo chamber Orchestra, performed with the Penderecki String Quartet, the NUMUS Ensemble, and worked with the KW Chamber Music Society in Waterloo, the InnerChamber Series in Stratford and the Colours of Music Festival in Barrie. I joined the Faculty of Music at Laurier in September 2012 and have been involved with the KWS Youth Orchestra program as a coach since 2010. In 2009, I was selected as one of only 5 Canadians chosen to be part of the very first “YouTube Symphony Orchestra,” where 90 musicians from 27 countries were selected from thousands of entries to perform a concert at Carnegie Hall, under music director Michael Tilson Thomas. Performed with Canadian orchestras including l'Orchestre Symphonique de Montréal, the Toronto Symphony Orchestra,and the Calgary Philharmonic. Played for artists from ensembles including the New York Philharmonic, the Philadelphia Orchestra and the Tokyo String Quartet.